Markets haven’t said anything negative in the last four trading sessions despite two worrying factors. After FED increased their Federal fund rate by 25 bps there was a massive rally in global markets but when comes to Indian markets we had witnessed a initial resistance near to 7800 levels with massive fall in India VIX numbers. And 7500PE writers more possibly by some smart bunch of retail traders who built highest open interest among Nifty option strikes had started covering open positions (profit booking) and later 7400PE writers also joined similar sort of unwinding despite rising markets in the noon session. The smart money comes in and the smart money comes out. And now the scenario is – the one who believed that 7500 is the key support zone for Nifty is no more! Does this imply crash in the market? Not necessarily! But without option writers support markets cant keep on rallying relentlessly. Despite of initial bearishness market started rallying in the noon session with IndiaVIX falling down to 14.09 and the 7400PE and 7500PE writers gone even more aggressive in unwinding their open positions (shorting 7400PE and 7500PE options). If the Option writers are covering their positions at 7400PE and 7500PE (smart money) then possibly it indicate likely increasing volatility in the near future. Be ready for crazy markets ever before! 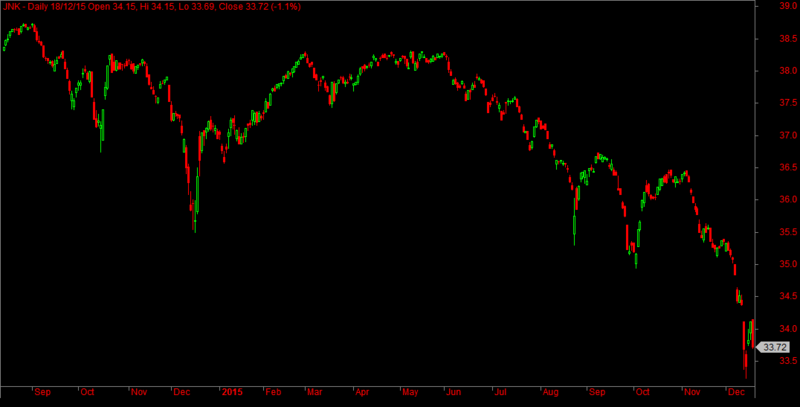 What about the Junk Bond Crashing? Nifty Futures Daily Sentiment holds positive so far and weekly sentiment holds negative for the last two weeks and only if markets sustainable 7800 on weekly basis with option writers at lower levels could bring more upside in the near future. Otherwise what the option writers done after FED announcement is they had just opened the flood gates towards the lower Nifty levels.